I know this seems to be a very bold statement, but I believe it is completely true. I am the Buddha! 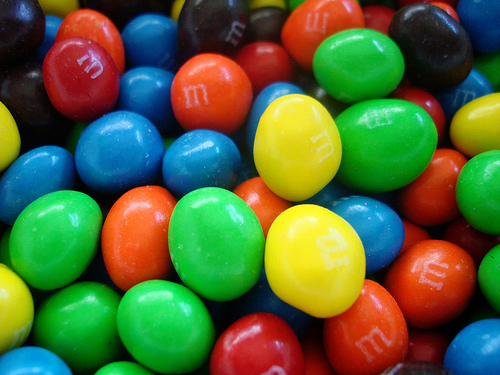 You see, I think each of us is like a peanut M&M candy. We have a hard sweet shell on the outside, and underneath that is a hard nut. And once you get through the hard nut, you are left with nothing or nothingness. Buddhahood! OK, so now you’re laughing at me right? Well don’t laugh, I’m being serious. And yes, I’m being sweet and a bit of a nut too. But I have realized today that I often get too wrapped up in the words and the Dhamma. I am making something simple into something that often seems very complicated. Even the Buddha initially was not going to attempt to teach others how to reach enlightenment. I think this is because it is beyond words. Not because it is too complicated, but because it is too simple. Get rid of your outer shell, accept the nut that is inside, then realize there is no nut. OK, OK, I have you laughing again right? But I’m trying to make it simple for you. Simple for myself to understand. For example, when I first started studying Buddha’s teachings (The Dhamma) I was not even aware of any of these layers of illusion. As I began to learn more, I found that Right Action, Right Speech, Right Intentions etc. helped me to be a better person. At that point, I had no idea that all I had accomplished was to create this candy shell. Sweeter and more appealing on the outside. But as I have studied and practiced more, I now find there is a nut underneath this exterior shell. And don’t we all have somewhat of a nut underneath the surface of what we show others? So now, my practice leads me to work on this nut part. The part that attaches and clings, desires to control or manipulate. I can no more control you than I could change the way the wind blows. And to think I can is simply nuts. Yet I still try. So now what about this last step of realizing there is no nut? Well, that’s enlightenment. And trust me, I am not there. But I see now why Buddha even said that when the time comes, you will let go of the Dhamma also. The teachings are merely a raft. Once we cross over and see the ultimate truth we will have no need of the Dhamma. So hopefully you don’t think I am completely nuts at this point. But perhaps you see that the path is not so complicated. And for me, I will continue to work on the nut until it is gone. For now, I remain a Buddha in a delicious candy shell. Just like you. We are all Buddha’s, once we get past the nut! Be well, happy and peaceful.